I’ve not been felling too well this weekend, boo hoo! I think just about everyone has had a Starbucks before. Unfortunately, there isn’t one where I live so when I do get my hands on one they’re a real treat! There’s some really funky Starbucks merch out there, like the whole, starWARS may the FROTH be with you and what not. I’d love to get my hands on this little cropped tank top though and for just over £12, I might just have to! I stumbled upon this skater skirt on the topshop website(where else) and I think it’s absolutely adorable! I adore the elephant print and it’s black and white so for £28 it’s a staple wardrobe item and it’ll go with pretty much anything! Deffo my favourite thing about this outfit! I’ve been looking for a pair of proper “going out”﻿ sandals and I think I’ve found some! This particular pair are guess and they’re beautiful! I’m sure I’ve seen them somewhere else online but I can’t think where, oopsy! Last year I really fell in love with wearing sandals all year round (like seriously I showed up to work in February in the pouring rain) so maybe I could ask Santa for these for Christmas? I really love this bag because it’s another staple item because you can never go wrong with a tan pleather bag. It’s a smallish size too which is great but not too tiny! It’s currently available from mango via asos! I’m really loving rings at the moment, gold ones in particular. I think the largest(#3) one is my favourite one! I love the vintage look it has and the fact that it’s big and bulky! Whilst searching for some for this post, I came across this one which is beautiful but I don’t think I’ll ever be able to justify spending that amount of money on a ring for myself. Current Obsessions: Fresh flowers and summer berries! So what do you think? Would you rock this outfit? Totally with you on the gold rings! I literally stack them on almost every other finger. 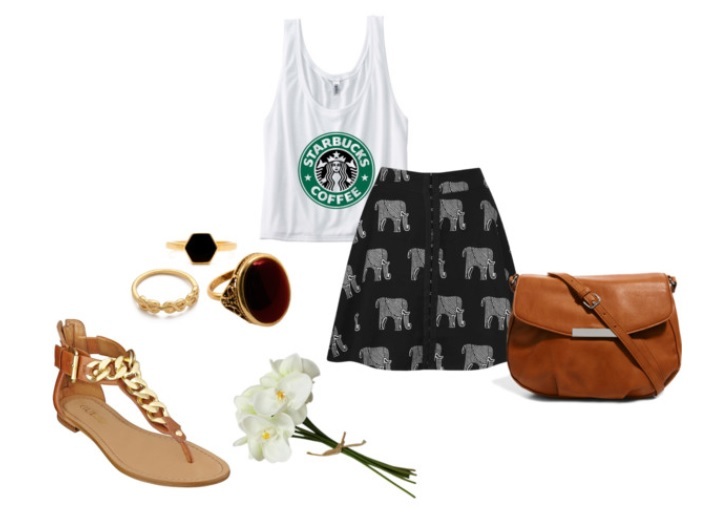 Aww the elephant skirt is to doe for, I need it in my life haha! <3 Love this outfit hun! Ironically I'm drinking Starbucks right now.. I adore that top! Hopefully you're feeling better!